Ask ten experts what the best food for pets is and you'll get ten different answers. The truth is, there is no one method of feeding your pet that is correct for all owners. To be successful, a diet must satisfy both the owner and the animal. It used to be a lot simpler. People have been feeding their animal companions home-made meals since the beginning of the human/animal relationship. That’s about 4,000 years ago for cats and 14,000 years ago for dogs - maybe longer. Commercial animal diets have only been with us for about 60 years. But what’s been developed, and what we have been told our pets need, is actually making them sick. First, a bit of evolutionary theory: Dogs evolved from wolves. Wolves are hunters. They eat raw animals like rabbits and other fresh kill containing organs, bone, and more importantly, undigested vegetables, nuts and berries. 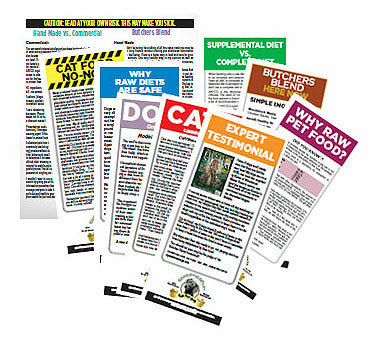 The raw diet replicates your pet's "natural diet" in the wild - without the gruesome part. deliver healthy nutrition to your pets. 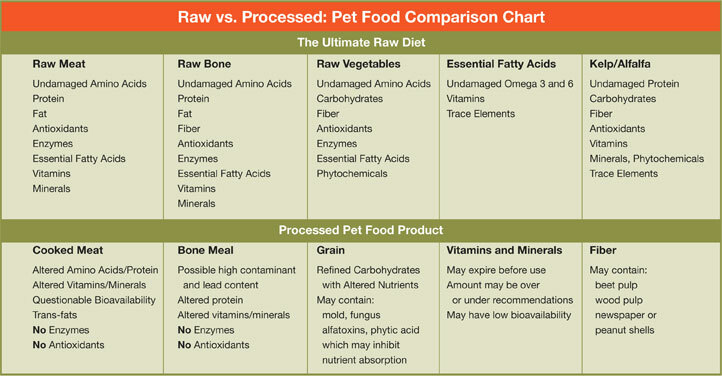 A raw diet will reduce your pet's stool size. Their body is utilizing and metabolizing all the good nutrition, therefore, manufacturing less waste. Smelly, loose stools are the norm with commercially manufactured foods. They get less nutrition and eat more because their bodies crave more nutrition. And their bodies excrete all the waste products that cannot be absorbed. With a raw food diet, you will soon notice your pet eating and drinking less because there is more nutrition and moisture in their raw diet. They are starting their day with a "balanced system"; not playing catch-up trying to re-hydrate their already depleted systems. Raw foods contain essential fatty and amino acids and vitamins for the highest level of nutrition. 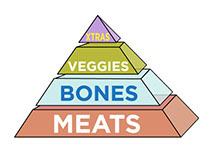 They include ground bones for optimum levels of calcium not found in commercially processed pet foods. Your pet actually needs bones. Raw bones are part of your pets healthy diet. Your pet’s evolutionary body chemistry will digest, dissolve and absorb pure, 100% natural calcium. Yum! Most Butcher's Blend formulas are ground with bone. The miniscule size will digest easily and safely. The Beef formulas do not have bone, as beef bones are enormous and hard to grind. However, they do make great treats and baby-sitters when needed. Do not cook this food. A raw diet, one that is not meant to be cooked, is not for everyone. It has to be right for the owner too! If you are uncomfortable touching raw meat or cleaning dishes that have contained raw food, then this diet might not be right for you. As every dog has different needs, my dog gets a variety of my blends with 1 human multi-vitamin and 1 pump of salmon oil every day. I add a whole egg a couple of times a week. Obviously, she gets a marrow bone to keep her off my shoes and every now and then, the butcher has extra chicken necks, livers, chunks of salmon, or organs that go in her bowl. No one loves me more than Lulu and it’s a delight to see her after a hard day of work. She is first in line with unconditional love (and some happy sniffing to see what I brought home for her). Raw Diet For 14 Years.